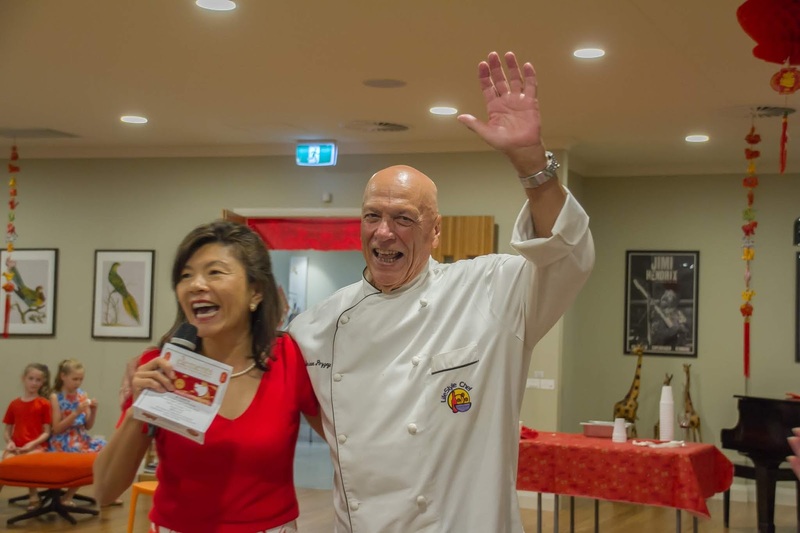 The CEO of our village, Chiou See, is a Singaporean Chinese, who loves cooking. She cooks her staff lunch everyday. 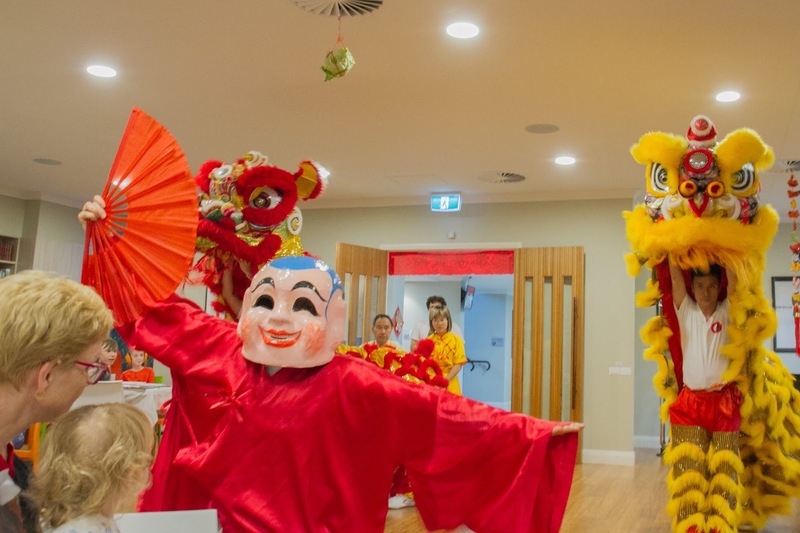 She also organises a fabulous Chinese New Year celebration for residents and their families. This year we had 250 guests. My good friends live in our village too. Dot and I met in hospital when we were giving birth to our first daughters. The girls are 47 this year. Our Maintenance Man and children enjoy the night . 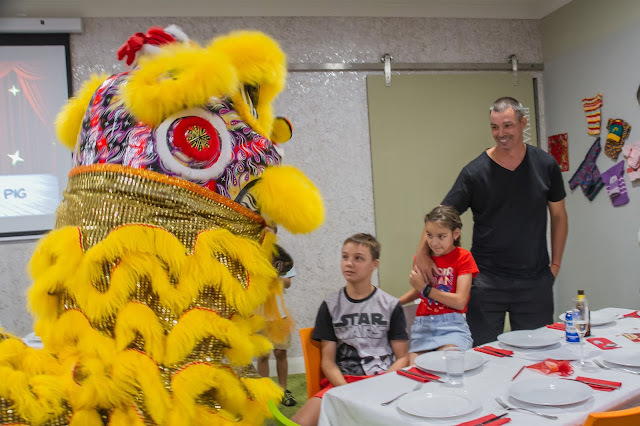 Feeding the Lions money in red envelopes for good luck. Later the eldest person in the room gives all the children a red envelope with money. All part of the tradition. There is also a Buddha Monk dancing and clearing the way for the lions and a drum band beating out the rhythm. The lion spots the lettuce. 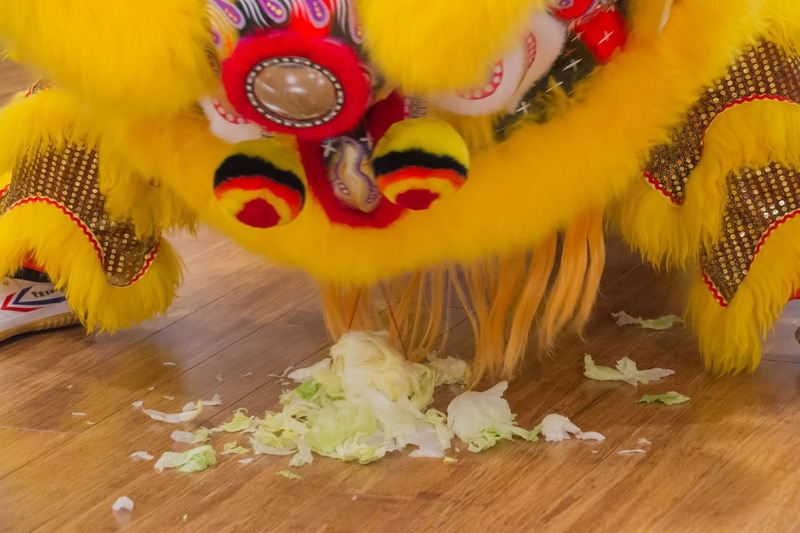 It usually takes some acrobatic moves of the two dancers inside the lion to reach the lettuce. 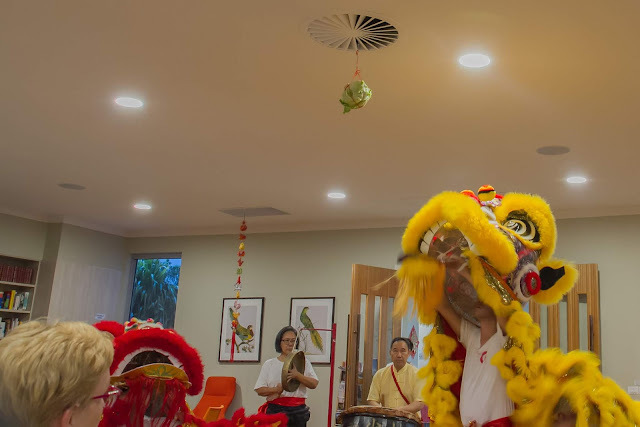 The lion eats it and then spits it out some goes over the audience and it is all to do with getting good luck and wealth. 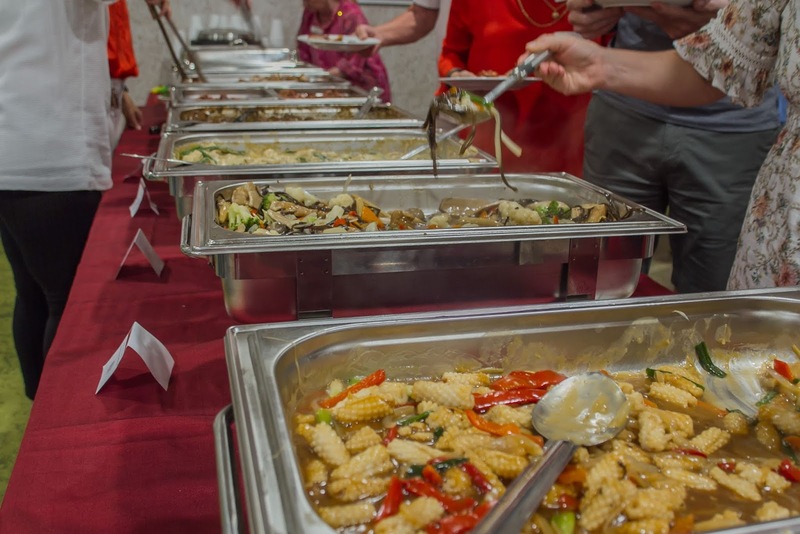 Chiou See and the chef cooked up huge amounts of delicious Chinese food for 250 people. 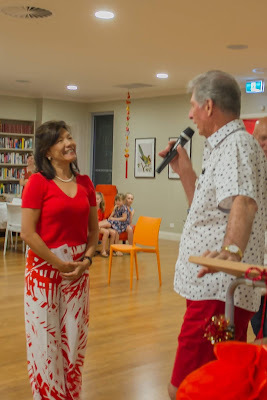 Finally, after a wonderful evening our residents' committee chairperson, Ian, thanked Chiou See for the great night of food, fun, friends and entertainment. Bill made a super 2 minute video-enjoy. Looks a lot of fun there Diane. Wow, without crutches, good on you..
Heaps of fun - goodonya! Lovely video. I hadn't heard of the lettuce spitting. Very amusing. Glad you could set aside the crutches. 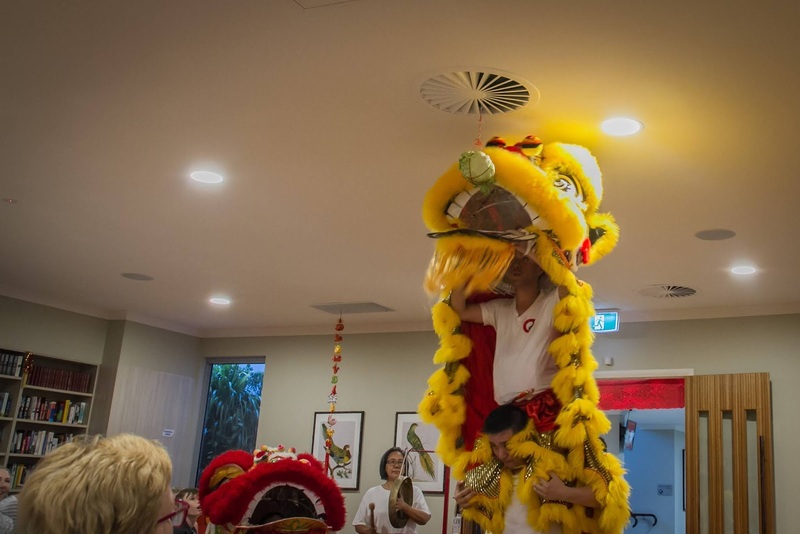 I didn't know about all of these traditions -- interesting to learn about them. That would have been something for me ! Fortunately you could "go" there ! We have Chinese New Year in Brussels and it starts on the famous "Grand Place" but I think this year it didn't take place, it rained too much for all these beautiful costumes ! 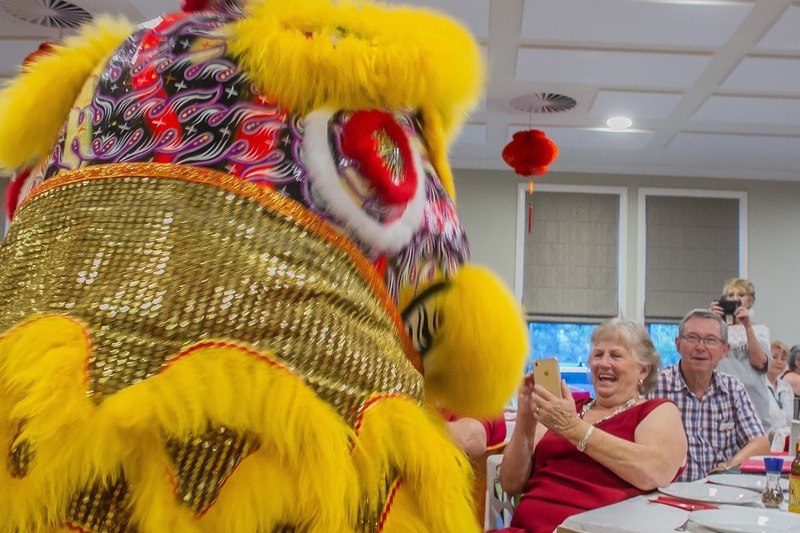 Hello, what a fun Chinese New Year party. I am glad to see you getting around without the crutches. Loved the photos. Happy Sunday, enjoy your day and new week. What a fun party and great mmovie! What a fabulous party. I've seen Dragon dancing here in Perth too but didn't know about the lettuce. No crutches? Hooray!! What a fun party. 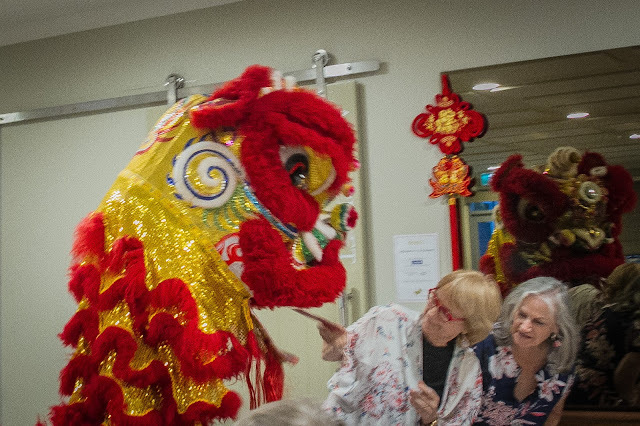 The colors are fabulous and i am intrigued with the fact that there are two dancers in the lion puppet. All in all, i think you will now have a very lucky new year! How absolutely wonderful a time you seem to have had. It must be lovely having a CEO who is so committed and talented. It looks as if you welcomed the new year in a wonderful way. Everyone seemed to be enjoying themselves, and the food looked delicious. I enjoyed Bill's video. What a wonderful way to welcome in the New Year. So colorful and I'm sure the food was scrumcious. Wish I could have some of it myself. Fantastic! 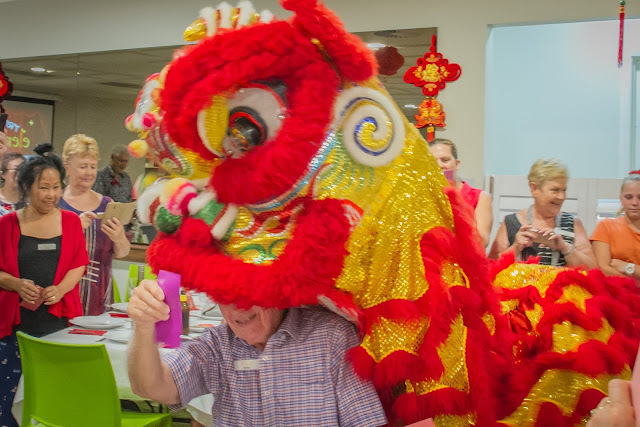 Your CEO of the village arranged a wonderful celebration for the Chinese New Year, always so colorful and festive. Bill's video was outstanding as were all your photos. 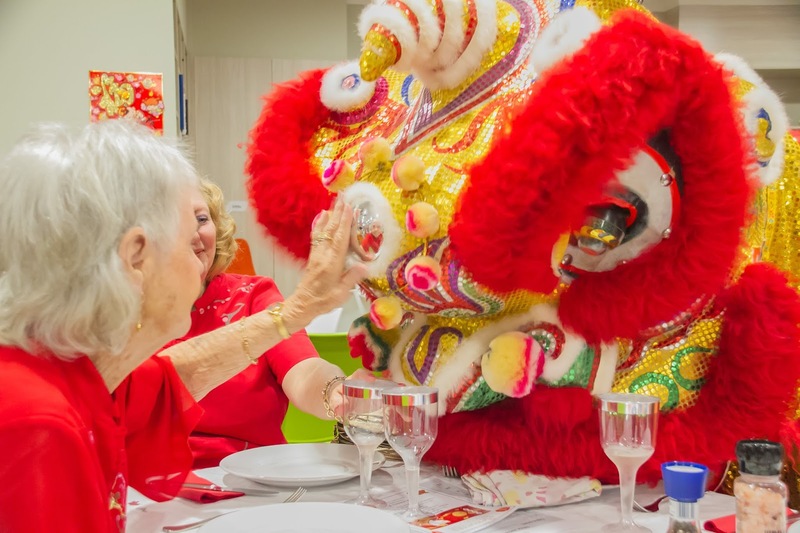 Thanks Diane, it was lovely celebrating the Chinese New Year with you all, the next best thing to being there. What a fantastic event, so colourful and so cheerful. Pleased to see you without crutches, continued good healing. Looks like everyone got some joy for the new year! A great lot of fun for everyone! Well done to Bill on his video ... loved the slo mo lettuce scene ;D) Oh, all that food looks wonderful too. What fun that looks. Nice to hear about the traditions associated with it. I remember this fun tradition from last year. Looks like everyone had fun - including the dragon! Good to see you without crutches. As I have said before, Diane, you have the best get social gatherings where you live now. We don't have anything coming close in the mill apts here except when friends get together for dinner. 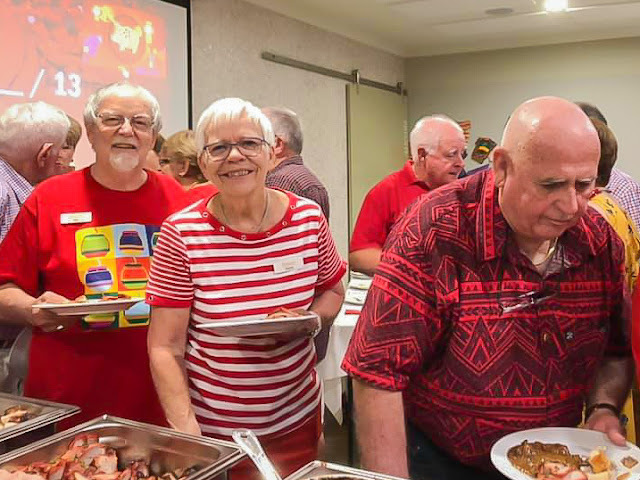 How great to see so many people having a great time and enjoying great food too!